With over 1.6 million members, the American Federation of State, County and Municipal Employees (AFSCME) is the nation's largest public service labor union and a leader in the fight for social and economic change. AFSCME members provide the services communities depend on. 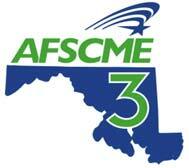 AFSCME Council 3 represents over 30,000 workers throughout the state including university staff at MD’s public universities, correctional officers, social workers, clerical support staff, nurses, and road maintenance workers. We organize in the workplace and fight for dignity, respect and a fair standard of living for all public service workers in MD. We are accepting applications for Field Organizing Specialists. Develop and implement organizing plans in a voluntary membership situation, building both membership density as well as workplace leadership structure. Recruit union stewards and activists: Identify, and foster recruitment and training of a network of union stewards who can assist members in problem solving, membership growth and communication. Grow Membership: Drive membership growth through site visits, phone banking, steward networking, and new employee orientations. Grow PEOPLE membership to empower our membership politically. Communicate our message: Serve as liaison with local unions regarding all elements of Council 3's political, legislative, and organizing programs, and ensure worksites in the state know about the campaigns and wins of their fellow members. Assist in problem solving at work for union members: File grievances and appeals, submit demand to bargain letters, help organize and attend Labor / Management Committees, organize direct actions and issues campaigns, develop and help pass legislation. Aid local governance: Attend union local meetings, inform executive boards how to comply with the requirements of their constitution and aid them in elections, amending constitutions, certifying convention delegates, etc. Support Council 3 events: Mobilize members to participate in Council 3 or AFSCME International events / actions, and help other staff with large mobilizations and campaigns in their turf as needed. At least two years of demonstrated success working in voluntary membership or external organizing campaigns. Demonstrated ability to get workers to take action to build and support their union. Ability to use Facebook, Twitter, Instagram and other social media to support membership campaigns a must. Ability to articulate how a union works. Demonstrated ability to plan and coordinate work activities to build power for 501c3, 501 or other progressive organization. Ability to establish and maintain effective work relationships with co-workers and members. Demonstrated experience with working in diverse communities and in a multi-cultural work environment. Sensitivity to and appreciation of ethnic and cultural differences a must. Demonstrated ability to conduct research and gather information for negotiations, strategy development and other servicing and organizing activities. Willingness and ability to work long and irregular hours and weekends. Some travel required. Car and valid driver’s license a requirement. Salary commensurate with experience-excellent benefits. Women and people of color are strongly encouraged to apply. Email cover letter and résumé to: recruiting@afscmemd.org.